Indians, especially people from Bihar, Jharkhand, and Uttar Pradesh are celebrating Chhath Puja, which started on 11th November, 2018. The festival is observed in the honour of Sun God or god of energy, Surya Shakti or Dala Chhath and Chhath Maiya. People, during this festival, thank Surya Devta for providing protection and further seek his blessings for good health and happiness. Celebrated on the sixth day in the month of Kartik, as per the Hindu calendar, Chhath involves people fasting and praying for four days, taking dips in holy Ganges and preparing offerings and feasts. People prepare puris along with sabjis like kaddu ki sabji, dudhi ki sabji, and even chana. In sweets, they generally prepare a sweet made of powdered rice, jaggery, saunf, and ghee. One of the most significant parts of the festival is thekua that is popularly prepared during this festival. Thekua is a sweet that is made of wheat flour, sugar or jaggery, coconut along with ghee and dry fruits. All the ingredients are rolled together to form small tikkis, which are then deep-fried in ghee. Also known as khajuria or thikari, thekua is widely prepared in the states of Bihar, Madhya Pradesh, Jharkhand, and West Uttar Pradesh. Traditionally, in olden times, thekua was prepared on earthen chulhas using mango wood as fuel; nowadays, people prefer preparing it using bronze cookware. Thekua is generally prepared on the second day of Chhath (which is known as kharna) or in the next morning, also known as Sandhya Ghat. After offering it to the Sun God, devotees distribute thekua in the form of prasad. Thekua is traditionally made of whole wheat flour, raisins, dry coconut, jaggery or sugar and ghee or refined oil. First of all, a solution of sugar or jaggery is made with water. This is then added to the wheat flour to form dough. This is followed by rolling a small chunk of the dough and pressing it against the wooden mould that has been greased with ghee. The flattened piece is then deep-fried in the oil or ghee till golden brown. Here's a simple way to prepare thekua at home on Chhath Puja 2018! Take crushed almonds and cashew nuts, mix with ghee and sweet soda. Add sugar in water and bring to boil. Add water to the mixture to form dough. Add oil in a vessel and let it heat. Work with dough to make small roundels and drop them in oil to fry. Fry until crisp, golden brown in colour. So enjoy the delicious sweetness of thekua and make this festival even more special! 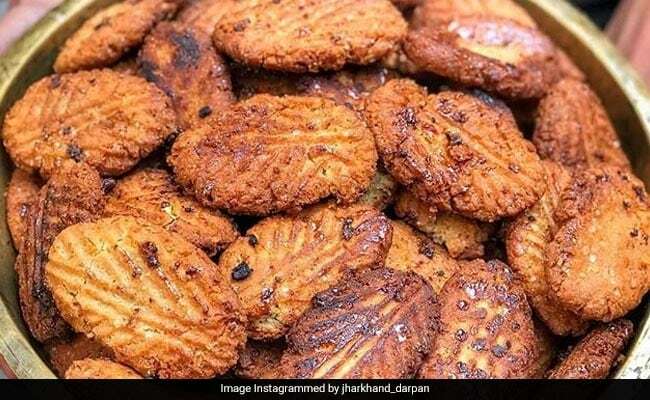 Chhath Puja 2017: 6 Chhath Puja Recipes that You Must Savour this Year!